Wine is often paired with food, but it can be inspiring to take a bottle of wine as the starting point and try to cook something that will go well with it. Oak barrels can give a hint of vanilla to wines, and so I thought it would be fun to make a vanilla cream sauce to go with a creamy oaked chardonnay. It worked out really well, and the pairing was outstanding. The wine went well with the vanilla creaminess of the sauce as well as with the seafood. 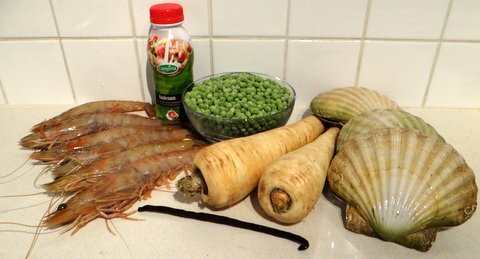 The combination of scallops with parsnip and peas is something I’ve used successfully before. This is a nice secondo piatto for an elegant dinner party. 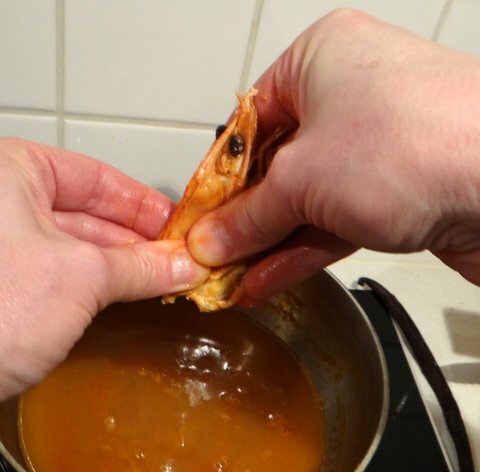 Peel the shrimp and reserve the heads and shells. 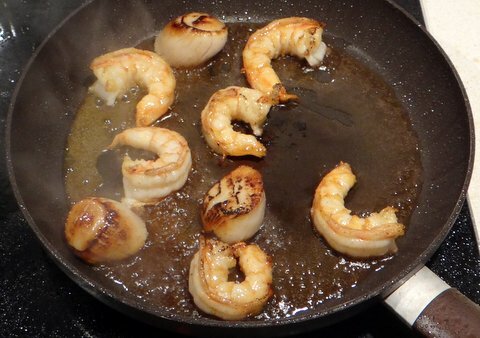 Heat 1 Tbsp butter in a saucepan and sauté the shrimp shells until pink on all sides. Cover with cold water and add the vanilla bean. Bring to a boil. Lower the heat and let this simmer uncovered for at least half an hour or so. Meanwhile, peel and dice the parsnip. 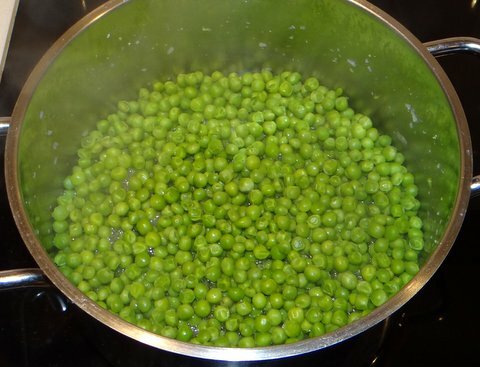 Boil in salted water for 20 minutes or until tender. 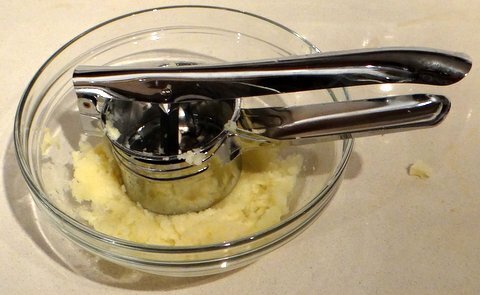 Use a potato masher to make parsnip puree. 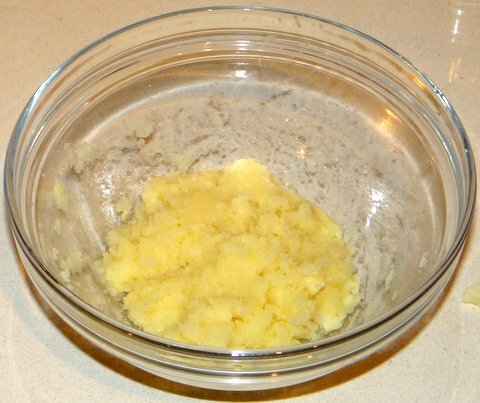 Enrich the parnsip puree with 1 Tbsp butter. Taste and adjust the seasoning with salt and freshly ground white pepper. Keep warm. 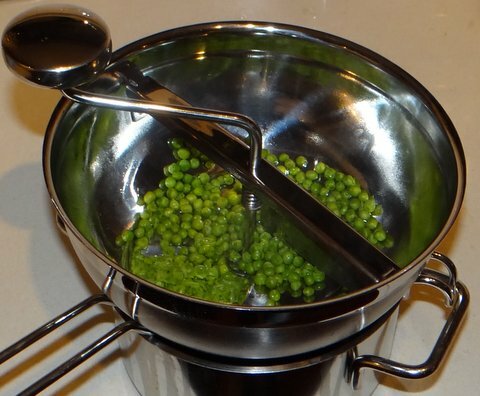 Use a food mill to turn the peas into puree. 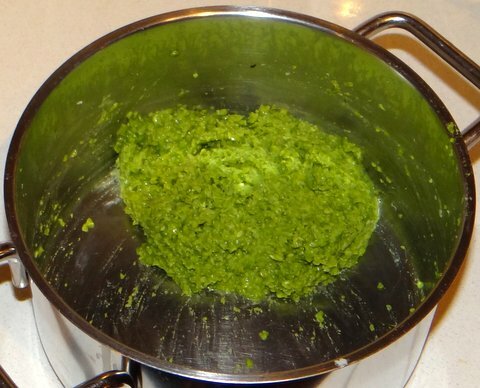 Enrich the pea puree with 1 Tbsp butter. Taste and adjust the seasoning with salt, freshly ground white pepper, and perhaps a pinch of sugar. Keep warm. 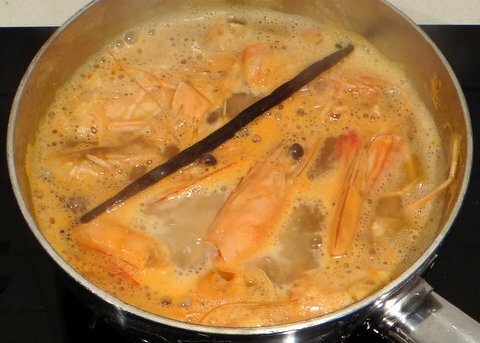 The shrimp stock is ready to be drained when about half of the water has evaporated (thus concentrating the stock nicely). 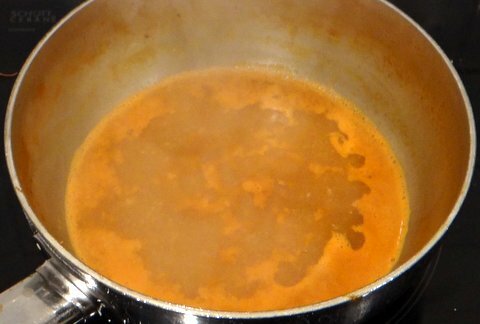 Let the shrimp stock simmer to concentrate it some more. Preheat the oven to 60C/140F. 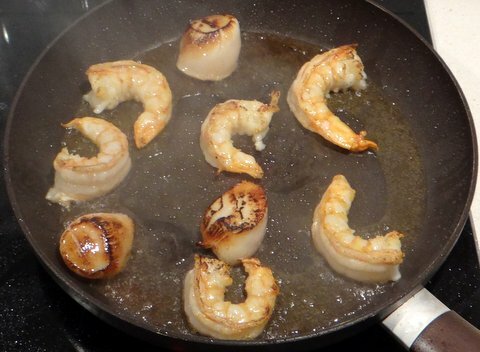 Pat the scallops and shrimp dry with paper towels. 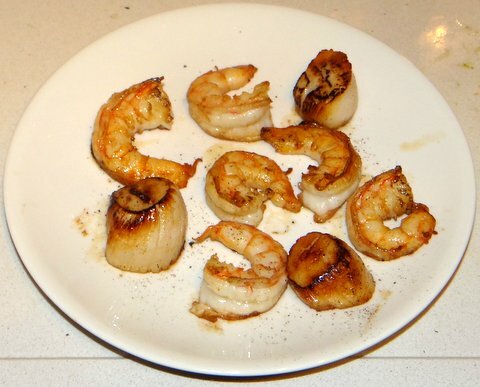 Sprinkle a tiny pinch of sugar on the flat sides of the scallops to let them brown more easily. Heat 2 Tbsp clarified butter in a non-stick frying pan over very high heat. 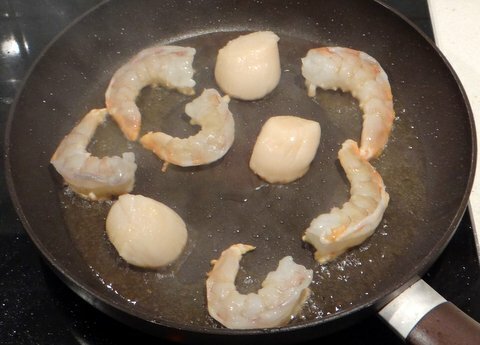 Add the scallops and shrimp and cook for 30 seconds to 1 minute. 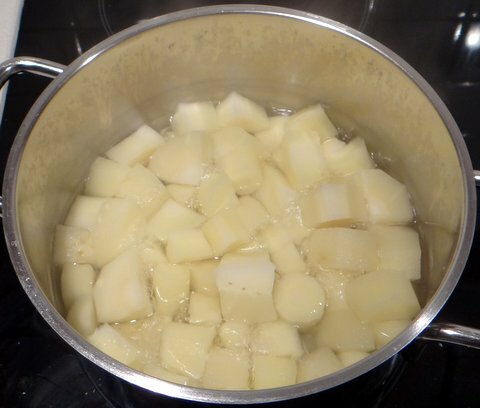 Turn them over to cook the other side as well for 30 seconds to 1 minute. Add the cognac and stir. If you like you can ignite the cognac to a flambée, but you have to be very quick because the alcohol will evaporate swiftly anyway. 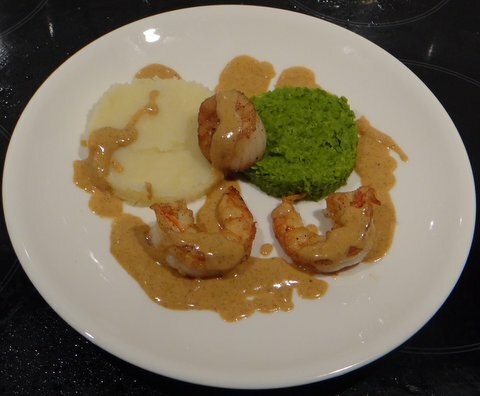 Remove the seafood onto a plate and keep warm in the oven while you finish the sauce. 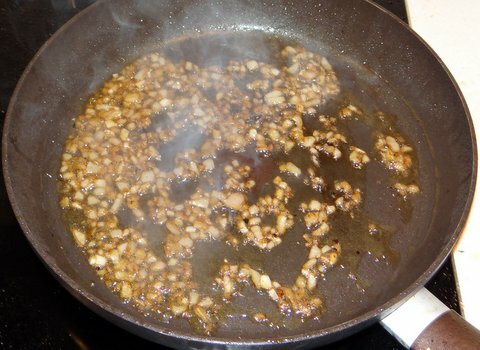 Add the shallot to the frying pan and sauté for 1 minute until golden. Splash on a bit of the white wine you’ll be drinking with the dish, and add the shrimp stock as well as a bit of lemon juice. 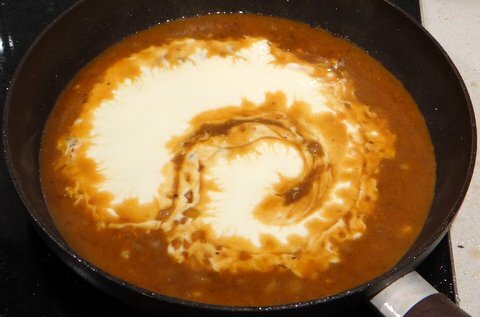 Lower the heat and add the cream. Cut the vanilla bean in half lengthwise and add it back to the sauce. 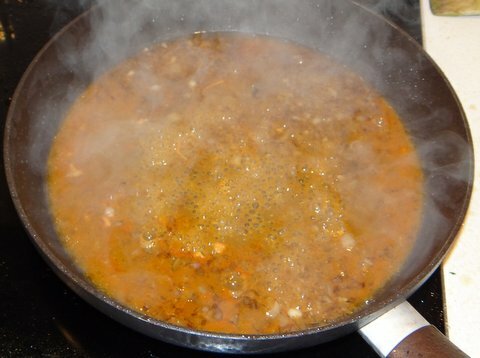 For an additional vanilla boost, you can scrape out the seeds and add them to the sauce. Let the sauce simmer to thicken a bit. 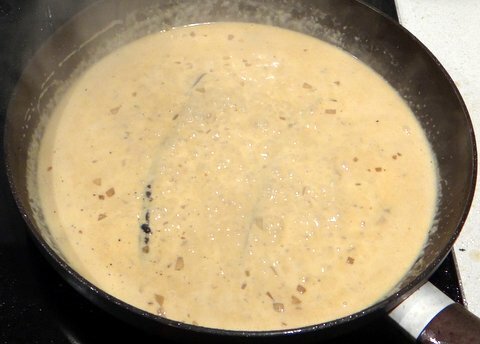 Sieve the sauce to remove the shallots and vanilla bean. Taste and adjust the seasoning with salt, freshly ground white pepper, and lemon juice (if needed). 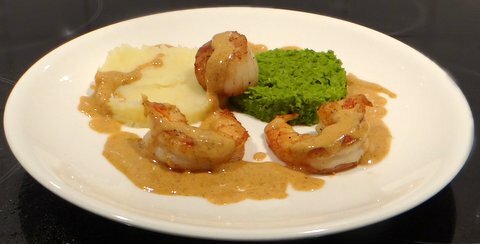 Arrange the vegetable purees and seafood on warm plates, and dress with the sauce. Since this dish was created to go with a complex oaky butter chardonnay, that is what it should be paired with. This Cuvée Bois from Les Crêtes in the French-speaking Valle d’Aosta in North-West Italy was an excellent combination. I love this machines you have the mincer thing is particularly interesting! It was served as part of a larger menu, with vongole and pancetta to start (post to follow), followed by the smoked salmon ravioli, the scallop and shrimp and pear tart for dessert. Oh. Wow. I bet coming to your house for dinner is a priority among your friends. Again great flavours. I enjoy reading your blog as you think outside the box and come up with great ideas. Great recipe. 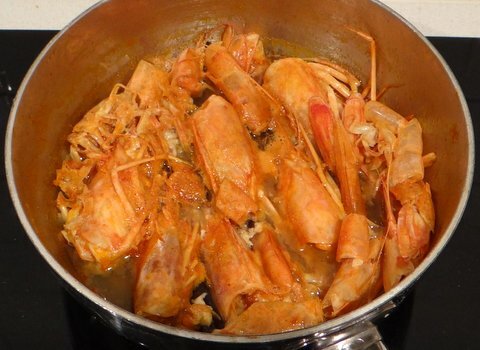 We’ve had vanilla as a flavoring with shrimp and langoustine and it is a terrific match…we will try this! As my youngest daughter said to me recently “Look at you, all fancy smanchy”. I am, of course referring to the last photo styled with the Liberace reject candelabra. Very stylish. The dish reads so well. I wholeheartedly approve of the reverse approach of matching the food with the wine. Thanks Conor. That candle just happened to be there, but I couldn’t resist putting it into the picture and I liked how it came out. I never really know what to expect, Stefan, when I come here. Being I’ve never used nor tasted vanilla used in this way, today’s post was a bit of a surprise. It sounds delicious and your step-by-step instructions are appreciated. It’s interesting that I’ve been cooking pretty straightforward Italian food for years, and that’s what most of my initial blog posts were about. But blogging has inspired me to try more new things, and I like it. More interesting stuff coming up, like how to skin a hare! And I LOVE Valle d’Aosta wines; both reds and whites! For red I only know Enfer or something like that. Quite unusual. Very intriguing recipe, Stefan. I always love seeing what you come up with. Sometimes, it’s very simple and straightforward yet elegant. Other times, it’s more elaborate and complex. Regardless, it’s always very well done and nicely presented. I never would have thought of pairing vanilla with shrimp. Now, I am definitely going to have to try it as you have piqued my curiosity. I am having a difficult time fathoming the flavor profile on this. Thanks for the nice comments, Richard. When you do get around to trying this, please make sure to have an oaky white wine with it to tie it all together 🙂 The same recipe also works with star anise, have you ever tried that? 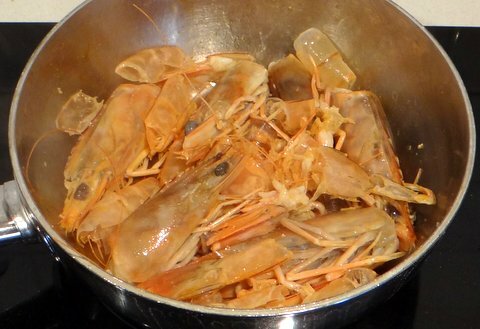 I have done shrimp (and other seafood) with star anise. It works very nicely. As for the oaky Chard, I’m sure I have one or two nice California Chards I can break out for this dish.